Why is "getting there" only half the fun? 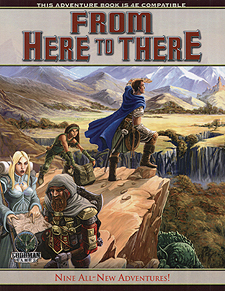 From Here to There presents nine all-new adventure focused on travelling from point A to point B. Sure, your players may be going from one dungeon to another - but why not spice up things in between? From aerial assaults to haunted bridges, From Here to There turns "getting there" into a lot more fun! Covering levels 2 to 13, this compilation has a place in every campaign.